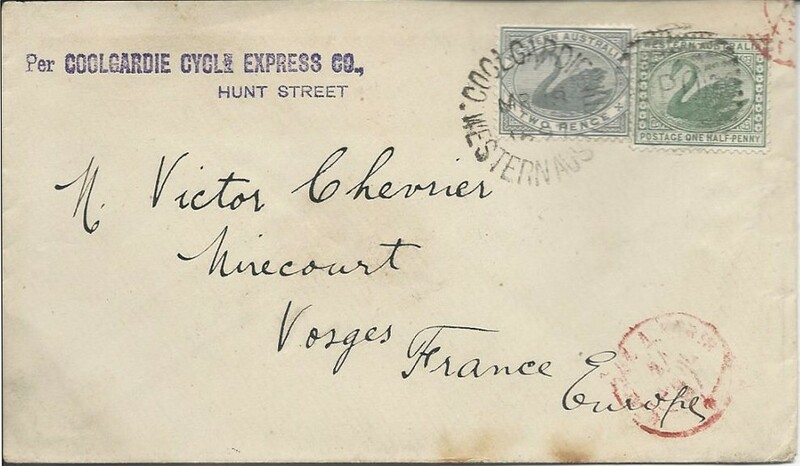 The auction was described as follows: „Coolgardie >>Mirecourt timbres 42,44 "per Coolgardie cycle express Co; enveloppe, 1897“. No further hint to this famous postal service. With a starting price of 7 euros the whole thing smelled after a real bargain. A few minutes before the end of the auction the price was still at 55 euros, but then in the last minute jumped to 600 euros. Still a bargain? - but not as additional information as on an envelope. 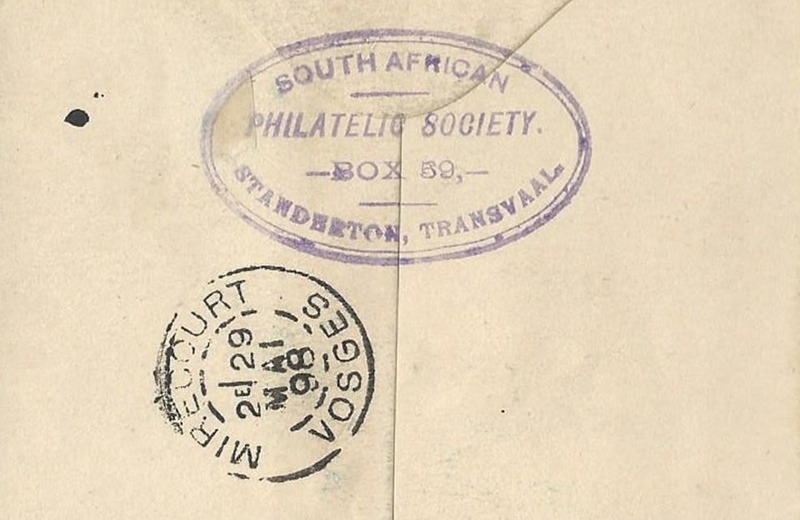 "Philatelic Society, Standerton, South Africa"
Monsieur Chevrier an ambitious stamp collector – no business man! 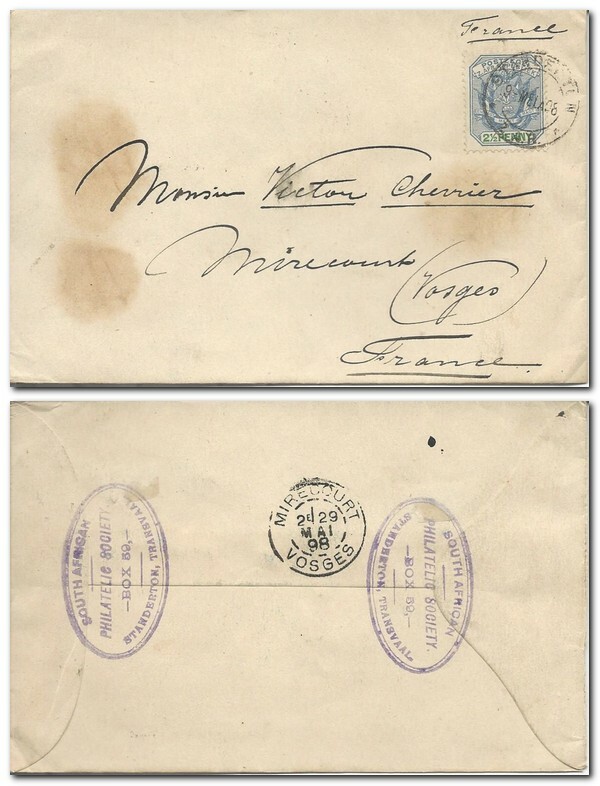 One and a total: it appears that at the end of the 19th century there was the possibility of ordering such "made" envelopes through stamp clubs from all over the world. These are no letters for need. Regarding the date you probably have to refer to a forgery in case of the above Coolgardie letter. 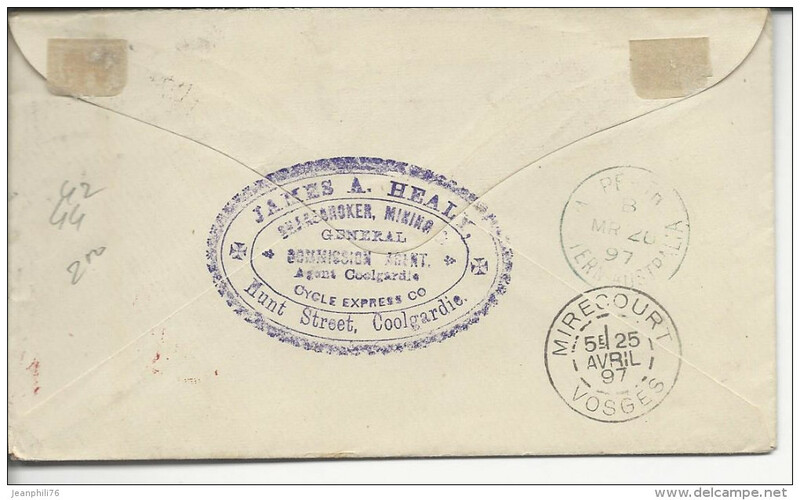 The object of the month - Mail delivered by "Coolgardie Cycle Express Co"
Our object of the month has traveled well, this month! 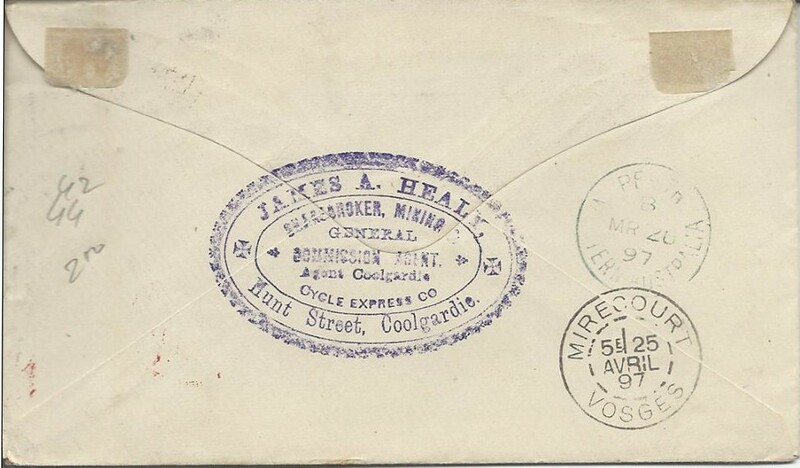 This is a letter from 1897 sent from Australia to Vosges in France. 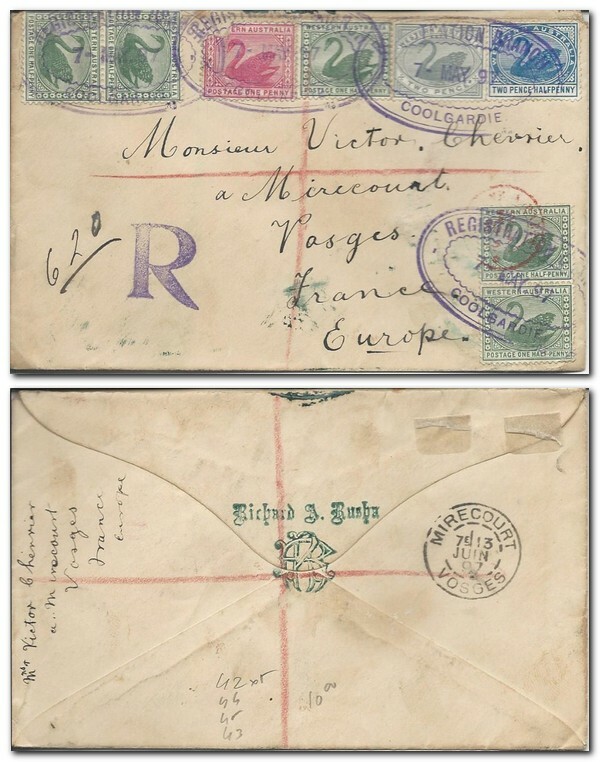 The letter is franked with 2.5 pence, split on two stamps showing swans from 1885 (gray swan: 2 pence, green swan: ½ penny). The mail was forwarded by the "Coolgardie Cycle Express Co". This company dates back to 1894. It was founded to transport the miners' mail from Coolgardie to the post office. It should be known that the gold found in the Coolgardie mine in 1892 made some 20000 Europeans come in a few years. This territory was 200 km away from the nearest post office. Thus the "Coolgardie Cycle Express Co" was founded. On the back of the letter the name of the brave cyclist, who delivered the mail, could be found: James A. Healy. These envelopes are not often found and this one is interesting for several reasons. The letter was offered at a starting price of 0.50 € and ended at 600.50 €. It has been put on auction by "Jeanphili76", a seller present on delcampe since 2003, whose positive average rating is 100%. 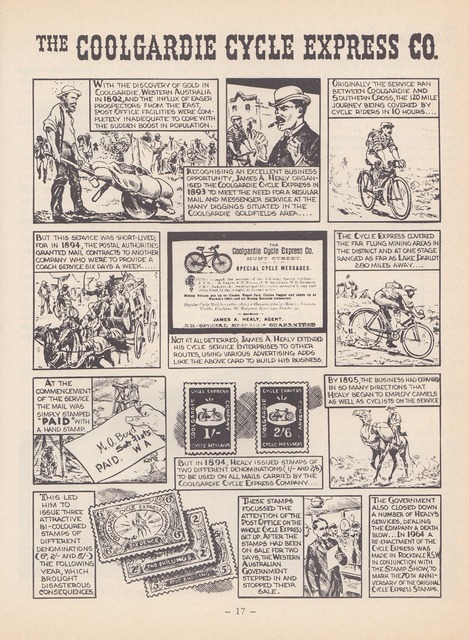 Well - one thing is certain: this was a remarkable auction - for delcampe, the seller, all fellow bidders, us bicycle stamps collectors and the happy(?) buyer. 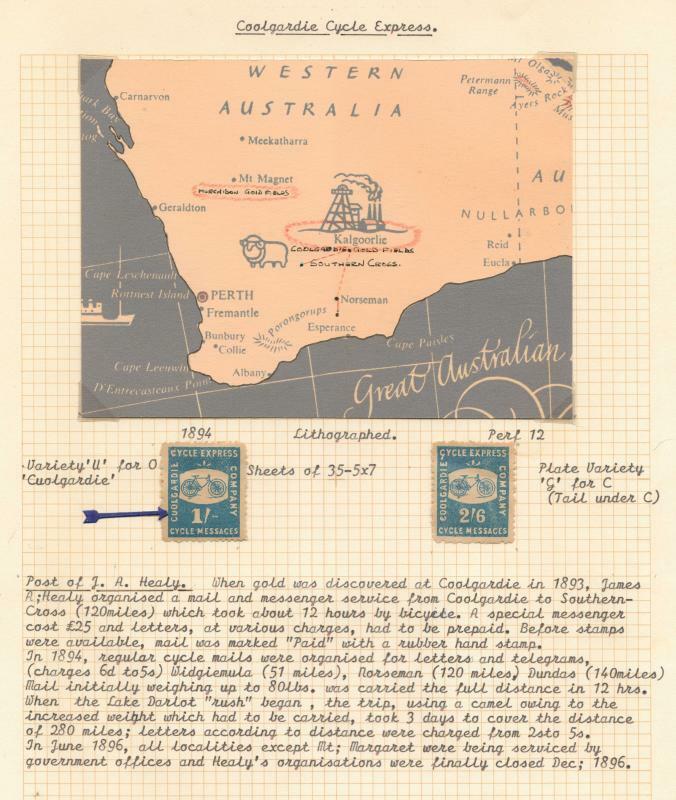 Coolgardie Cycle Express Service, paper from Dr. Maurice Alan Mishkel published on the website "Australian Postal History & Social Philately".